The journey linking Europe's closest capital cities might be considered as a classic train journey as both cities offer plenty for the tourist to explore. Perhaps the relatively short journey has something to do with it but sadly this route offers little to commend it. With a train every hour Austrian Federal Railways provide the carriages and locomotives with Slovakian Railways offering a single carriage in the formation. To make the best of the limited views en-route it is recommended that you find a seat in the open vestibules of the Austrian coaches. 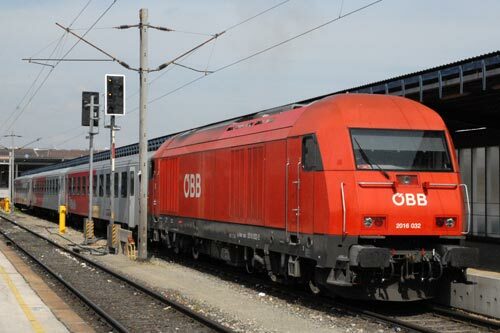 Photo - Departure from Vienna Sudbahnhof with Austrian Railways 2016 032 at the head of the train. Departing from Vienna's new Hauptbahnhof (from late 2012 onwards) or a rather basic Sudbahnhof when the journey was undertaken the journey time of just over 70 minutes for the 66km is not particularly fast. Routed via Marchegg the train crosses the border into Slovakia shortly after this station to join Slovakian Railway tracks to the north of Devinska Nova Ves from where it is a short trundle to Bratislava hlavna stanica (main station). Sadly there are no scenic highlights to enjoy as the first part of the journey sees the train thread through the suburbs and industrial landscape of Vienna. Crossing the River Danube is perhaps the highlight of the trip as passengers are afforded an excellent view of this great European River. From there to Devinska the landscape is flat and uninteresting. Entering Slovakia there is a noticeable change with Austria's superior wealth supporting high quality railway infrastructure. Sadly the railways in Slovakia have rather less investment and some of the rolling stock is covered in graffiti. The final section of the journey into Bratislava is rather more scenic with the final approach to Bratislava through a tunnel. Hlavna Stanica is a busy station with a good range of facilities for travellers.